Located at the dock in Sainte-Anne-des-Monts, Exploramer is a museum focussed on the marine environment of the St.Lawrence River. 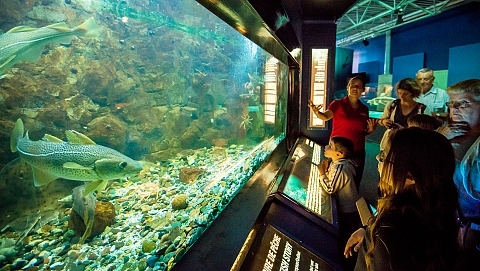 With its aquarium park, touch pools, exhibitions, sea excursions, fish harvesting activity and Smarter Seafood certification, Exploramer offers visitors the chance to "discover the sea". 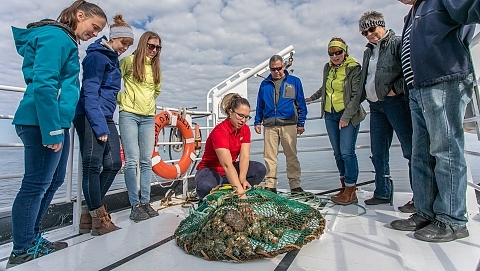 Take your experience a little further... board the JV Exploramer and set out to sea for an ecological cruise during which you will learn about the ecosystem of the St.Lawrence. Watch rock crab and waved whelks fishing traps being hauled from the water or participate in the collecting of scientific data. A fun way to discover the fascinating world of the St. Lawrence. Put on a pair of waders and, feet in the water, follow the guide from the beach out to the fyke net. At low tide, discover what's hiding beneath the surface and learn about plants and animals that live there. Take part in an experience that will allow you to discover the Gaspé shoreline and the various species caught by the fishing net. This animated tasting activity, led by a guide, allows you to discover the responsible choices offered by the St. Lawrence and taste five marine species valued by Smarter Seafood. 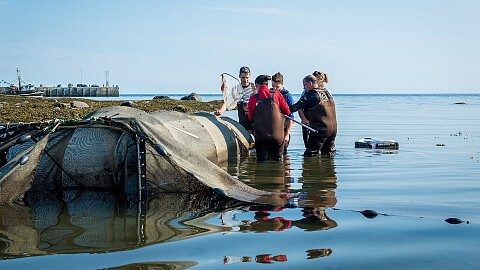 Smarter Seafood certifies restaurants and fish markets that choose to get involved in a marine resource sound management approach by introducing to their customers marine species that are comestible and in sufficient quantity in the St. Lawrence, but unknown to consumer's market. Every journey has its memories. To help you preserve yours, Exploramer’s boutique features a broad variety of "small treasures" you can offer to someone you love... or keep it for yourself! Filled with sea-themed souvenirs, objects crafted by Gaspesian artisans, local products and a large collection of reference books dealing with the many aspects of the sea, our selection is sure to please you. During your Exploramer visit, tie up for a break at the Quay's Bar for more discoveries. Our lunch counter is overflowing with Smarter Seafood certified products, comforting soups, hot croissants, local beers and espresso drinks. Open from June 1 to August 31, 2019. Interpretation Centre Schedule: June 1 to October 6, 2019, daily, 9 a.m. to 5 p.m.
Average length of visit: 4 hours. Every day from June 1 to September 2, 2019. From September 3 to October 6, 2019, reservations are required 24 hours before the excursion. Discover the St. Lawrence: 11 a.m. and 3:30 p.m.
A laboratory at sea: 1:30 p.m. Schedule for fish harvesting activity: This activity is offered at low tide. Consult our website for details.